Are you looking for a Seaside Florida rental? 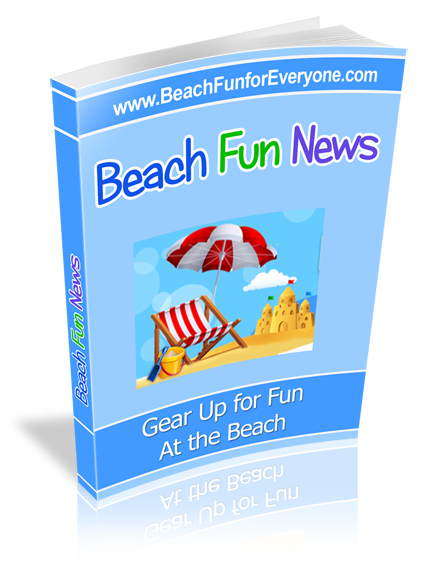 You can find something for every size family or fun get together. 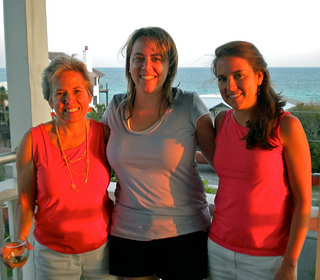 Our family has enjoyed the best family beach vacations at or near Seaside and we've stayed at a variety of places. For a large family gathering rent a house. A house gives everyone a place to gather for a leisurely breakfast or a yummy grilled hamburger. Even though a house may cost more upfront, we find that it is quite a money saver by eating our meals at home. You will find that all the houses in Seaside and the Seagrove Beach area have names. 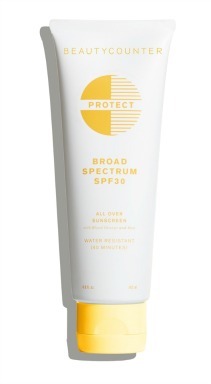 Sunkissed, Beach Haven, and Angel in the Dune are names that certainly conjure up pictures of an idyllic place. Sea Grove Beach is also walking distance to Seaside and most of our stays have actually been at houses in that area. 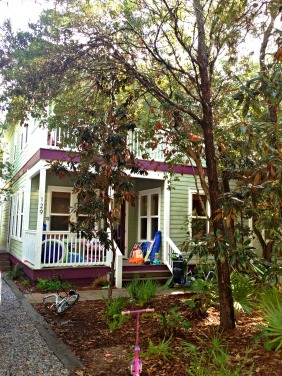 Beach access is right across 30A and there are many houses for rent that are only a few blocks from the beach. 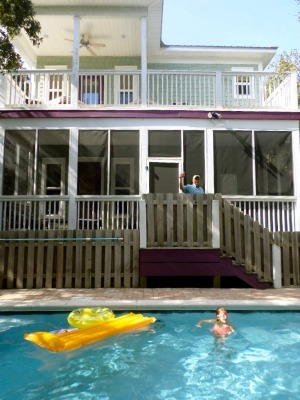 Our number one consideration is how far is the house/condo from the beach? Can we walk it comfortably carrying all of our beach gear? Is it a comfortable distance for small kids to walk? Can we get back to the house easily if we forgot something or if one of the children need a nap? Every year we seem to pick the same area around Seagrove Beach with houses just a block or two from 30A. Cross the road and we are at the beach. Sometimes we have stayed at beach condos that offer golf cart services that have taken us to the beach and brought us back home. Either way find out where the house is in relation to public access to your nearest beach. 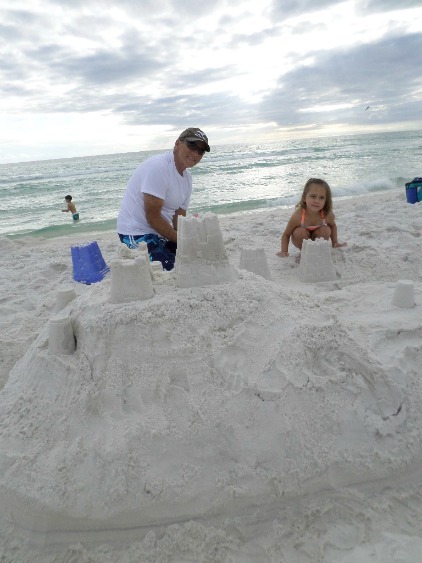 You can narrow down your options for Seaside Florida beach rentals by the number of bedrooms you want or need. Many houses have bunk rooms that can sleep 4 like ours did at Sunkissed. Others will have additional places to sleep other than bedrooms that include fold out couches. The other consideration is if your guests or family members want to share a bathroom. 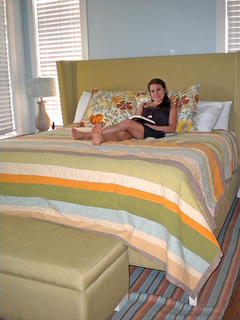 Many beach vacation homes are now built so that there is a separate bathroom attached to each bedroom. Check it out before you rent. Many of the larger homes have several floors - some up to four stories if you count "the tower" or observation deck where you can enjoy a glass of wine and a beautiful sunset. One year we wanted to include my 80 year old father on our beach vacation, but he could no longer do steps because of a dropped foot and weakness in his legs. We had to look for a place that had access to the main living area and a bedroom/bathroom that didn't involve alot of stairs. Many homes with several floors will have at least two separate living areas and some even have more than one kitchen. Our family loves to swim - in the beach and in the pool. A backyard swimming pool provides a wonderful retreat from the hot afternoon sun. With lots of shade, and plenty of pool toys we find it a great place to cool off. 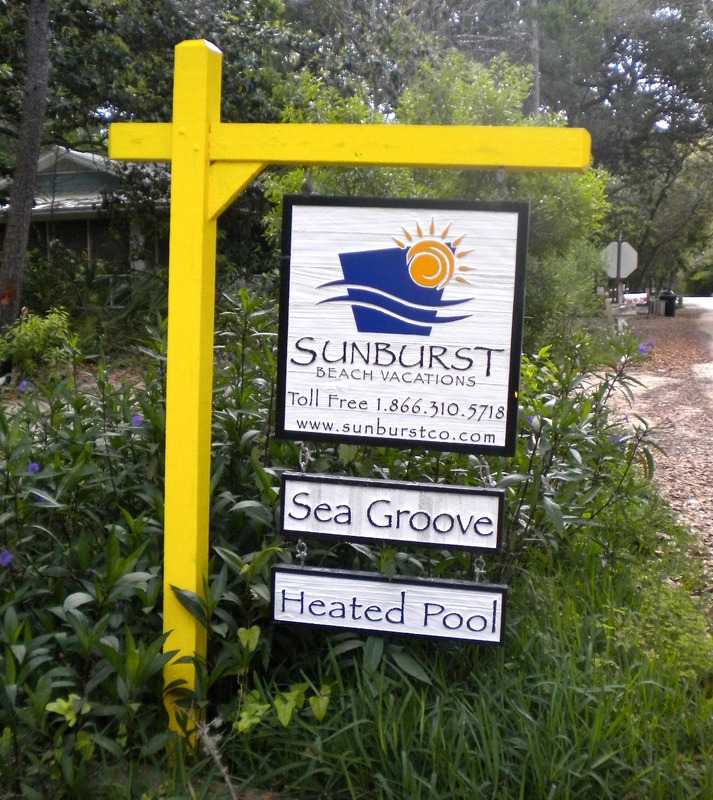 We usually stay in Seagrove Beach where there is no community swimming pool. But if you rent a vacation home in Seaside or Water Color, most of the time the rental will include access to their community pools. 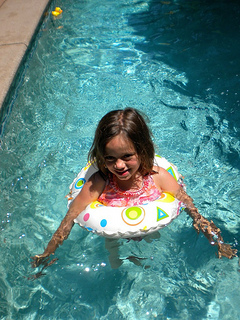 Most swimming pools have a heating option for an extra charge. When we go in early May we've added this amenity to take the chill off and it's been well worth it. Depending on the home owner, pool floats and toys may be provided, but if not bring your own. We go on a beach vacation to be outside. 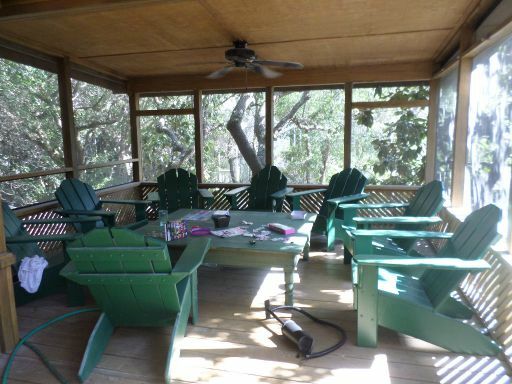 Now we look for rental homes that have screened in porches with fans and outdoor tables by the pool. We've stayed in some beautiful homes that we won't go back to - the insides have been beautiful but they lacked outdoor living areas. This home, called Solterra, is located in Seagrove Beach and it accommodated everything on our wish list including a large screened in porch, chaise lounges with thick cushions and an outdoor dining table and chairs by the pool. Enjoy your morning coffee on the screened in porch, indulge in some quiet reading time on the cushioned lounges on the upper deck and share a meal together by the pool. Another year we stayed in Sea Grove at a house called The Treehouse. We loved the large screened in porch with a fan so we could enjoy some non-beach time together at the house - outside - playing games, putting together a puzzle or enjoying conversation. We had to hose off the porch when we arrived as it was quite dirty - but we were glad we did as we spent a lot of time there. May is a beautiful month to be at the beach - you can enjoy the beaches, bike paths, restaurants and roads without the crowds. And best of all it is considered off season for most rentals which translates into big savings. Once our grandkids started school the month of May was no longer an option for us and I was amazed at how much more a weekly rental cost in June, July and August - almost $1,500 more. The most expensive times are usually the week of the Fourth and the summer months. The least expensive time is November, December, January and February excluding holiday weeks. Many homes have a minimum number of nights that are required - most often it is 7 nights but some houses can go as low as 3 night minimum stay - depending on the time of year. A Seaside Florida rental home provides the convenience and privacy of a house and allows for great opportunities for family together time.